Image caption Taylor Schofield was described by his mother as a "very bright, intelligent kid"
A driver who admitted killing a boy in a hit-and-run had been banned from the road on three occasions, a court heard. Michael Ricardo Robinson, 31, pleaded guilty at Manchester Crown Court to causing the death of Taylor Schofield by dangerous driving on 12 January. CCTV showed him travelling at an estimated 55mph (90km/h) before he knocked Taylor off his bike in a 20mph zone in Beswick, Manchester. Robinson, whose last driving ban was in 2017, will be sentenced on Wednesday. The 31-year-old, of Toft Road, Gorton, had been banned from driving for two years as a youth in September 2004, before receiving a second two-year ban in 2006 for driving whole disqualified. He received a third ban, lasting 12 months, in April 2017. Gavin Howie, prosecuting, told the court a witness had seen Taylor stop and look both ways at the kerb on Albert Street at about 18:05 GMT before being flung into the air by the force of the collision. In a statement, Taylor's mother, Beverley Law, said her son had been "excited" at being able to ride his mountain bike again after it had been recently fixed and had messaged friends on Snapchat to join him in playing out. CCTV footage from a pub close to where the boy was hit was analysed using specialist software, which estimated that Robinson's VW Golf was travelling at 55mph, Mr Howie said. 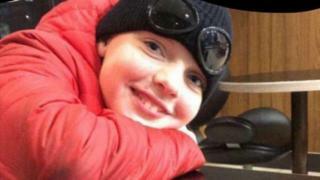 Taylor, described by his mother as a "very bright, intelligent kid", died from his injuries 30 minutes later. The court heard Robinson got out of his vehicle following the "glancing blow", but then "panicked" and drove off. Defending, Brian Hoffman said the 31-year-old turned himself in the same night and had subsequently co-operated fully with police. "He expresses his apologies to the family of Taylor for the hurt and harm he has caused them," he added. Judge Martin Walsh remanded Robinson in custody ahead of sentencing.